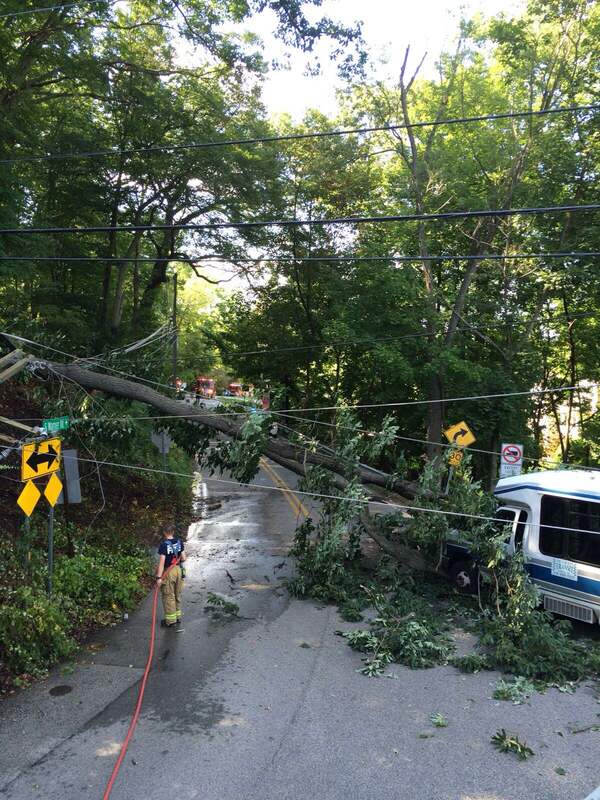 On Thursday, August 13, 2015 Rescue box 56-57 was struck at the intersection of Croton Road and South Warner Road. Rescue 47 (Lt. Griffith Jr.) and Engine 47-2 (FF Jenkins) responded out of the Allendale Road Station and Squad 47 (FF Raskiewicz) out of the Beidler Road Station. Rescue 47 was notified by Montgomery County Communications that a tree had come down in the area and has brought wires down and PECO was notified. Prior to Rescue 47’s arrival, the unit was again updated that there was no longer a rescue, but the wires down created a bush fire in the area. Rescue 47 requested an engine company from Radnor Fire Company (Delaware County Sta. 15) for assistance with the brush fire and South Warner Road Command was established by Lieutenant 47-2. Members operating on the scene aggressively contained the fire with rakes and shovels until PECO was able to arrive and confirm that the electrical power lines were not dangerous to the members. Once PECO arrived and gave the confirmation units were able to extinguish the fire quickly with the use of hose lines stretched from Engine 47-2 and Radnor’s Engine 15-1. Thank you to Radnor Fire Company, Upper Merion Police, and Lafayette Ambulance for your assistance during this incident.